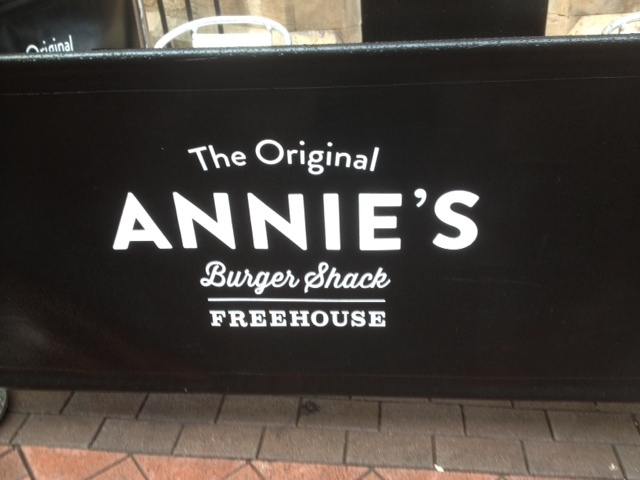 I think by now I have told everyone that I know that they have to eat at Annie’s Burger Shack in the Lace Market. I can honestly say that not a single person has had a complaint about the food. the only moans I have heard is that they cannot get a table because it is so popular. I have written so many times now about Annie’s Food that you would think I am on some sort of retainer, I am not by the way, although some sort of Burger bonus would be excellent in my imagination. the reality is that I like to dine undercover so that I get the real experience. If you want to see what we think of Annie’s Burgers take a look here at one of our reviews (Annie’s Burger Shack in the Lace Market – New Location, Continued Burger Excellence!). 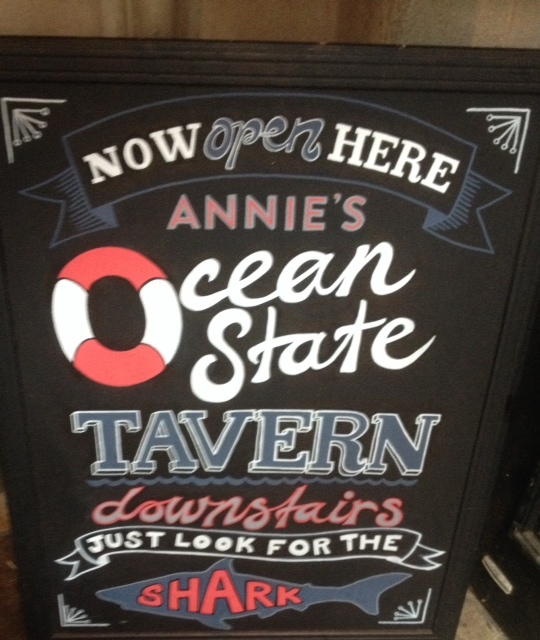 What appears to be less well known is that you can get some really excellent beers at the bar upstairs at Annie’s and more recently (well since July 4th this year to be more exact) you can drink some good beer in her Ocean State Tavern downstairs. We thought that it was about time that we went and checked the tavern out to see if we wanted to add it onto our Lace Market Friday night circuit. The sign warned us to watch out for the Shark and to follow the stairs down into the bar. It doesn’t look quite as Pixar or Disney in reality as it does in the photo. With the camera those eyes look quite disturbing. The reason for it being there is according to Annie is that “Jaws was filmed just off Rhode Island,” and that is the state from whence she came. OK so here is the first reason (actually this is enough reason) to drink at the Tavern. They had bottles of Goose Island 312 on sale, one of my most favourite beers from my former home of Chicago and something that regular readers of this blog know that I seek out all over the city. It was great to find it here, but not so great to find that it was the most expensive 312 in the city at basically £5 a bottle (that is pretty steep my friend). There were plenty of decent beers on the tap including this Urban IPA from Tiny Rebel Brewery they say that “A carefully crafted intercontinental blend of hops helps us take traditional IPAs to the next level with Urban IPA. If you’re bored with soulless IPAs drunk by farmers in wellies, it’s time to go URBAN” Kind of neat I suppose. It also was quite pricy as well. Lets not talk money any more its getting vulgar and I suppose we are paying Lace Market prices. So to sum up the ‘Tavern’, I like it is kind of dark and a bit grungy almost industrial in its styling. They have a great selection of beers and you may need to consider a slightly larger withdrawal from the ATM machine if you want to drink here all night. Having said that I have never had any room left for beer after I have eaten one of Annie’s Burgers so perhaps that is the idea, just one more quality beer to finish the night? No I want to have my burger and eat it and drink it all after as well.